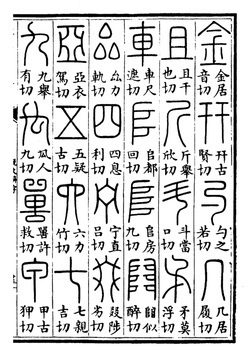 One of the oldest Chinese dictionaries (early 2nd century) explains meaning of five movements. This article explains, that number five is a sum of two numbers as 2+3. Number two is the even number and it is YIN number. Number 3 is the odd number and it is YANG number. ​Yin and yang are parts of heaven and earth and they meets and separate exactly at noon. We can see it in pulse as it was described in third chapter of Nanjing about victory of yin and yang. As we can see on the picture number five was written as X between two horizontal lines. These horizontal lines are earth and heaven. As we can see number five as five movements is sum of two and number three is sum of three. Number two is only one pair. Number three is sum of equal parts of Heaven, Earth and Man. Number five in five movements is sum of two not equal yin and yang parts, which meets in the middle by point. ​Shuowen JieZi 先秦兩漢 doesn't explains meanings of yin and yang. Yin and yang appeared much earlier. Author explains other terminology using yin and yang. Five movements appeared thousands years later and their ancient explanation is different of modern one. Five movements are transformation of unequal parts of yin and yang. 1,3 and 5 are yang, 2 and 4 are yin. Yin and yang are unequal. It is a reason of yin and yang victory we see through the pulse. Inequality produces rise of yin and stops sun from continuing rising, day starts to decline towards yin after noon. We can see it through the pulse during yin and yang victory. In the example of Shuowen we see how yin is taking place of yang during the year in early ten months Chinese calendar, when each month was 36 days. To make these changes of yin and yang during the year and during the day five movements can't be equal as we can see in modern explanation of Traditional Chinese Medicine. Archaic acupuncture observes through the pulse inequality of yin and yang during the day in different moments of yin and yang victory, fifty yin and yang periods, one hundred ke and 13500 pulse breaths. It is a basis of treatment developed thousands years ago using this inequality to treat the disease. Excess of Rong would be presented by deficiency of Wei and excess of Wei will produce deficiency of Rong. Excess and deficiency are translated from Archaic Chinese as true and false showing their inequality. Treatment of Archaic Acupuncture based on Nanjing classic of difficult issues is based on pulse and uses excess to fulfil deficiency or treat the correct to relieve the false. Below are three images of patient with metastasis of sternum bone before and after two months of of acupuncture assistance. Left image shows sponge like neoplasm without evident borders. Second and third images shows good visible boarders with conclusion that size is stabilised and didn't increase in last 6 months. Treatment was directed on SanJiao meridian, only one excessive meridian according archaic acupuncture pulse diagnosis. As patient was arriving in the morning in time of yang victory for this person, excessive Rong qi of SanJiao was fulfilling deficient Wei. This method involves use of Qi breath or another kind of renewable solar energy in form of mega long radio waves which our body receives through it's capillary system, known to ancient Chinese as Jing Mai, vascular connection, meridians. Now we can measure these waves, record them and observe how different pathological processes start when reception of this energy is affected and how these pathological processes stop when this reception normalises.